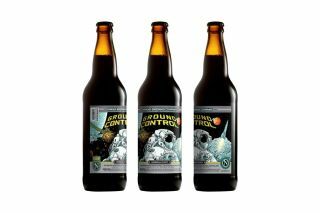 The beer Ground Control, brewed by the Ninkasi brewing company, uses yeast that traveled to space. The beloved German folk festival known as Oktoberfest wraps up this weekend (at least in Munich), so we decided to get in on the celebration and taste-test a beer made with yeast that's been to space. In 2014, the Oregon-based Ninkasi Brewing Co. sent vials of brewer's yeast on a rocket to more than 70 miles (112 kilometers) above the Earth. The yeast returned unharmed and ready for brewing. The final product is an imperial stout called Ground Control, which has now been taste-tested and approved by members of the Space.com staff (check out the video). Earlier this year, representatives from Ninkasi Brewing Co. spoke with Space.com about the nearly two-year-long quest to make a beer with yeast that had flown to space. The first time the brewery tried to send the yeast skyward, the payload made it all the way through its journey safely, but it landed in a remote location and couldn't be recovered for almost four weeks, leaving the yeast unfit for brewing. However, a second launch led to a quick and successful recovery of the space yeast, and a delicious final product. The Ground Control stout is also brewed with hazelnuts, star anise and cocoa nibs. It's rich like an imperial stout should be, incredibly velvety with none of the bite found in some stouts, and full of flavor. In fact, it's a great beer for new stout drinkers. Ninkasi isn't the only brewery to try putting a little space in their beer. In 2013, Dogfish Head made a limited-run beer that was brewed with dust from lunar meteorites(yes, pieces of the moon that had crashed into the Earth), which were steeped in the drink like tea. "These certified moon jewels are made up primarily of minerals and salts, helping the yeast-induced fermentation process and lending this traditional German style a subtle but complex earthiness," according to the brewery's website. Dubbed "Celest-jewel-ale," this spacey beverage also came with a custom spacesuit beer koozie made by ILC Dover — the contractor that made the actual Apollo astronaut spacesuits. For a cosmic-themed Oktoberfest celebration, beer drinkers might also consider some space-themed brews. There are the widely distributed classics like Blue Moon and Corona. When you throw in beers from smaller breweries, there are really too many options to mention. If you live in the Southeast region of the United States, definitely check out the spaceflight-inspired beers by the Huntsville, Alabama-based brewery Straight to Ale, including its Monkeynaut IPA, made in honor of Miss Baker, the first monkey sent to space by NASA who returned alive. You could also pick up a beer made with galaxy hops, a variety native to Australia. There this White Galaxy IPA by Anchorage Brewing Co. Other beers brewed with galaxy hops include Hill Farmstead Double Galaxy, Half Acre Double Galactic Daisy Cutter, and Pipeworks Galaxy Unicorn. Over the last year, Bell's Brewery, located in Kalamazoo, Michigan, has slowly released its Planet Series of beers, inspired by Gustav Holst's composition "The Planets." The beer series includes seven brews, one for each planet in the music series, which did not include Earth. The music series, which was written around 1914, did not include Pluto, which was discovered in 1930. Demonstrating a wonderful sense of humor, Bell's Brewery put out a video in which its employees read some of the comments the company received when it released its Uranus brew. A great resource for finding space-themed beers in your area is the website beeradvocate.com — simply enter space-related words or phrases in the search bar. For example, check out these links for lists of beers with "space," "black hole" "galaxy," "sun," "cosmic," "nebula" or "orion" in their names. Some of our favorites include Space Cake by Clown Shoes brewery, Tart Side of the Moon by Brewery Vivant, Northern Lights IPA by Starr Hill Brewery, and Space Dust by Elysian Brewing Co. There also Klingon Ale from Garrison Brewing, and quite a few spacey-brews from Cosmic Ales. We hope you find a great space brew to ring in Oktoberfest.